Butler Snow Advisory Services (BSA) is pleased to announce that Michael E. Harris, a seasoned business executive, has joined as principal in its Memphis office. He brings more than 40 years of corporate leadership and business experience to the BSA team. Harris most recently served as executive vice president and chief operating officer of Highwoods Properties, Inc. (NYSE: HIW), a publicly traded real estate investment trust (“REIT”), based in Raleigh, N.C., and a member of the S&P MidCap 400 Index. Harris retired from Highwoods on Aug. 31 after 19 years of service, and has recently relocated back to Memphis. Throughout his career, Harris has been intricately involved in virtually all aspects of leading and managing the operations of a company – from the development, leasing, acquisition and management of commercial real estate to oversight of various corporate divisions, including regional operations, development services, asset management, corporate marketing and human resources. 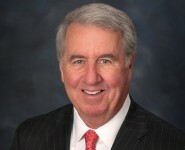 Prior to joining Highwoods, Harris was executive vice president of Crocker Realty Trust before Highwoods’ acquisition of that company in September 1996. Before joining Crocker, Harris spent 15 years as senior vice president, general counsel and chief financial officer of Towermarc Corporation, a privately owned real estate development firm. Harris began his career serving seven years as a senior commercial lending officer at First National Bank-Little Rock and Union Planters National Bank-Memphis. Harris earned a bachelor’s degree in international relations and affairs from the University of Mississippi, a Juris Doctor from the University of Arkansas School of Law and a master’s of business administration (finance) from the University of Memphis. He is a member of the Urban Land Institute, Lambda Alpha International Land Economic Society (past president – Memphis chapter) and a past member of the American and Arkansas Bar Associations. He has also served on the advisory board of directors of Wachovia Bank – Memphis and Allen & Hoshall, a design and engineering firm.